REGINA — One offensive touchdown doesn't win a lot of football games. 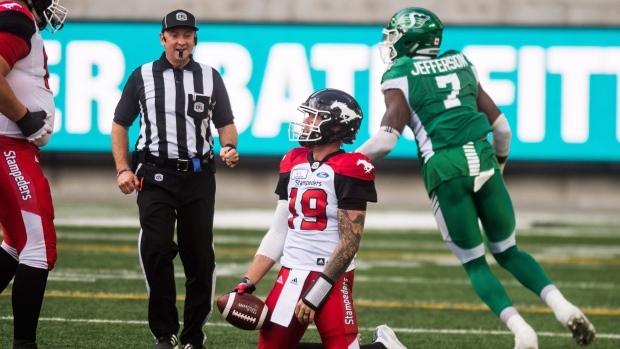 But the Saskatchewan Roughriders were buoyed by a relentless defensive effort and a spark on special teams in their 40-27 upset victory over the previously unbeaten Calgary Stampeders. "This is a huge win for us … we just beat the No. 1 team in the league and it tells everyone else that we're here," said Riders linebacker Sam Eguavoen, as his team improved to 4-4. "We didn't need a lot from the offence tonight. Defence and special teams is two-thirds of the game and they carried us — made a lot of plays." Calgary was aiming to become the fourth team in the past 50 years to start a CFL season with eight consecutive wins. Instead, they see their record slip to 7-1. Bo Levi Mitchell, despite throwing for four touchdowns, was under pressure for the majority of the game. The Riders blitzed and showed some unorthodox formations on defence that led to uncharacteristic misplays from the Calgary quarterback. He was sacked five times and intercepted once, with one of those sacks resulting in a lost fumble. "You pressure the quarterback and you'll win in this league. End of story," said Calgary head coach Dave Dickenson. "That guy in the CFL wins and loses games." Saskatchewan quarterback Zach Collaros completed 25 of 34 pass attempts for 270 yards, though he was held out of the end zone. The Riders were playing their first game without receiver Duron Carter, who was a league all-star in 2017. Carter was released earlier in the week. Jordan Williams-Lambert picked up the offensive slack with a team-high 10 catches for 152 yards. Shaq Evans had five receptions for 69 yards. Mitchell completed 22 of 36 attempts for 275 yards. DaVaris Daniels led the Stampeders with five catches for 83 yards and two TDs. Kamar Jorden had five receptions for 66 yards and a TD, while Romar Morris rushed 13 times for 70 yards. The Riders' lone offensive touchdown was actually scored by full-time defensive back Nick Marshall on a three-yard run at the goal line. The cornerback also scored a touchdown on a 67-yard interception return, which put the Riders ahead 14-0 after the first quarter. Eguavoen's blocked punt and return for a touchdown and Brett Lauther's third first-half field goal sent the home team into the locker room with a 24-6 lead. Calgary's first possession of the second half was more of the same. Mitchell was sacked and fumbled on the play, with the Riders recovering deep in Calgary's end. Three plays later and Marshall was dancing in the end zone after his short touchdown run. The Riders' lead swelled to 31-6. "He's just a ball player," Rider head coach Chris Jones told the media of Marshall, who was a quarterback at Auburn University in the NCAA. Jones added that Marshall would likely see more short-yardage touches in the future. But Mitchell and the Calgary offence showed some fight following the Marshall score. They rallied for 15 unanswered points on back-to-back touchdown drives — scores from Jorden and Daniels — and Calgary was back in it, trailing 31-20 after three quarters. Lauther kicked three more field goals — he had six on the night for Saskatchewan — in the fourth quarter to match Calgary's touchdown with Mitchell finding Daniels again. Though, Calgary just couldn't get any closer. "We got outplayed, outcoached," said Dickenson. "They seemed to play faster. They had a little bit more edge. They were a little more physical. They executed a little better. When you put all of those things together and when you're playing a good team you're going to get beat." Both teams are back in action on Saturday with inter-division matchups. Calgary will return home to take on the Winnipeg Blue Bombers, while Saskatchewan is on the road to tangle with the B.C. Lions. "We're going to enjoy this one for sure, but we can't let it get to our heads," Eguavoen said. "We have another big divisional game on a short week so we have to be ready to go and keep this momentum going."